Although the incidence of fractures is low and accounts for less than 3% of all ankle injuries, ankle fractures constitute a major time-loss injury for athletes. Optimal management of ankle fractures should therefore address the demand for early and safe return to sport. Open reduction and internal fixation has established itself as the standard of care in unstable ankle fractures. Depending on the fracture type, fracture stability provided by ORIF can allow for early rehabilitation and enable return to sport within 2–4 months. ORIF, however, is associated with substantial surgical exposure and inherent complications. Arthroscopic reduction and internal fixation (ARIF) and arthroscopic-assisted open reduction and internal fixation (AORIF) have been introduced to provide fracture stability and treat fracture-associated intra-articular injuries while minimizing surgical exposure and further optimizing outcomes and return to sport. 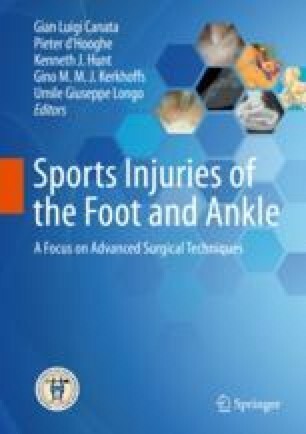 The aim of this chapter is to offer an evidence-based overview of the current literature regarding the indications for the use of arthroscopy in the treatment of acute ankle fractures and associated injuries in athletes.